A long shoreline with serene beaches, tranquil stretches of emerald backwaters, lush hill stations, sprawling plantations and exotic wildlife. 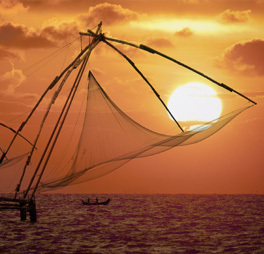 Kochi or Cochin is popularly known as the Queen of Arabian Sea also flaunts one of the finest natural harbours of the world and centre of the world spice trade for many centuries. 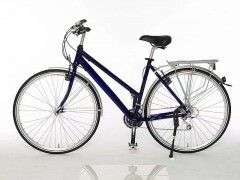 A nice way to explore the city through cycling. Arrive in Cochin and transfer to the hotel. Walk to Cochin Fort around mid day to watch its grandeurs of the colonial times. While sitting by the sea side we will experience the famous Keralan cuisine with a view of the world famous Chinese fishing nets. 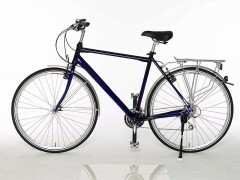 We will assemble our cycles after breakfast for warm-up trip on calm Sunday morning. We will be heading towards south of Cochin near the sea passing through villages and stretches of backwaters. We will present ourselves in the Keralan kathakkali Dance performance in the evening. 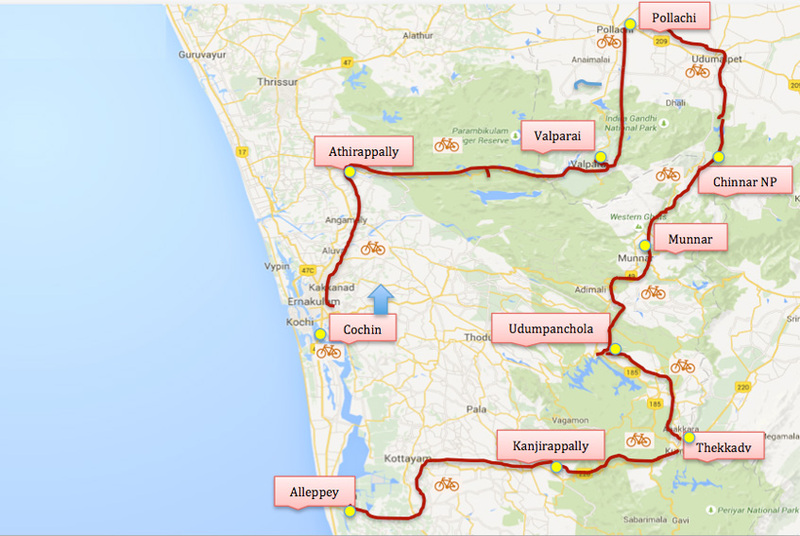 We will start our first stage of cycling tour to the gates of Cochin. Soon we will reach middle of evergreen lovely Keralan countryside and ride will end near the beautiful waterfalls of Athirappally. What a great moment for the cyclists ? The day will begin passing through entrance gate of the forest. We will pass on the steep climb which is actually not too steep. But for the nest 50 km we will pass on through the rainforest which offers lots of unforgettable views. Here onwards to Tamilnadu border the scenery will change from rainforest into tea plantations. Ahead if this we will enjoy special greenery of tea bushes for about few kms. At the beginning of the climb which is easy to manage we will have impressive downhill stretch enjoying eye view of Aliyar dam and lake in the plains. We have not to be in a hurry otherwise, we can miss this spectacular experience. Riding easy section towards Udumalpettai we will have breakfast. Turning right from here we will face Western Ghats once again. Covering 15 km rural area we will reach at the entrance gate of Annamalai wildlife Reserve, the home of Tigers, wild animals and other class of species. After visiting Annamalai wildlife Reserve we will be ascending and will reach another reserve, Chinnar Wildlife Reserve. Reaching upon wildlife reserve where we will spend the in forest bungalows, thereafter we will watch wildlife guided by local forest wardens. After leaving reserve at Marayoor which is famous for scandal wood forests and its products. Here we come know how jiggery is made traditionally from sugar cane. For the next 25 km the task is quite challenging with movement upwards through a beautiful valley with tea. After we cross pass another Wildlife Reserve, Eravikulam will welcome us, which highlights little endemic mountain goat. We descend down to Munnar, the source of tea manufacturing city since British Empire. You can buy the real tea from here. We will have a great trip today through excellent sceneries of tea, coffee, prepper and cardamon plantations. A banquet for all the senses. Next two nights will be spent in the plantation home at the foothills of the rainforest to experience the nature. This is the day for relax from cycling. You can enjoy the view of the ranges of Western Ghats from the terrace or can walk leisurely through the spice plantations in the village. Continue cycling through plantations and hilly forests to Kumily, the border of Tamil Naidu on small roads. Finally when we reach downhill section we will reach Pepper County, which is our home stay. Pepper County is in the middle of a spice plantation having glorious views of the valley. In the morning we will handle a last ascend which will be followed by a impressive 20 km downhill cycling to let ourselves reach into the land of rubber. In between we lose 1000m of altitude. In the morning we will meet rubber tappers to learn how the rubber is made . We reach Backwaters at Chaganacherry and move ahead to the nearby traditional Keralan house, where the houseboat will be waiting for one night’s experience of Backwaters cruise. Check-out from the houseboat we start begin a relax tour through villages alongside Vamband Lake and Malabar coast. On the way you can stop for swimming in the sea. Here we can see how coir is made from coconut fiber from the people present at the coastal area. Feel free to attend classes in traditional Keralan cooking offered by Kerala family. You can watch while fishing or this can be tried by yourself. If you want the day can be used for another swim in the sea or shopping can be done in Alleppey. In the evening farewell dinner will be taken in home garden and will have a little rest before early morning rise.